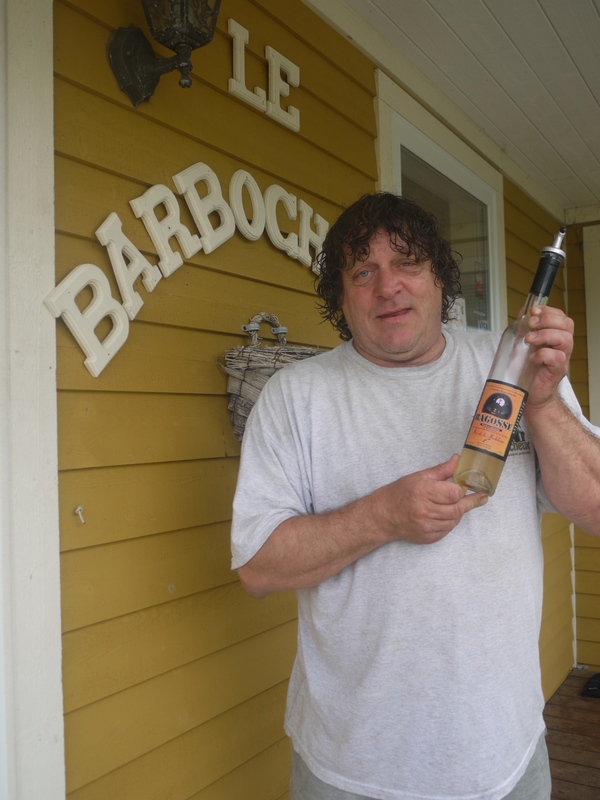 Leonce Arsenault holds a bottle of Bagosse in front of his shop. We turned right at the sign that read Le Barbocheux, and drove down a long lane leading to an old home to visit the man of the Magdalen Islands, we were told could tell us about Bagosse. The Magdalen Islands or Îles De La Madeleine, are a group of 12 islands in the mouth of the St. Lawrence River in Canada. The population of 12,000 plus residents, live in colourful homes on six islands linked by long and slender sand dunes. The islands are part of the province of Québec and the culture is mainly Acadian and French Canadian, although there is a small English speaking community of those of Scottish, Irish heritage. The islands can be reached by air and sea from Montreal or Prince Edward Island. 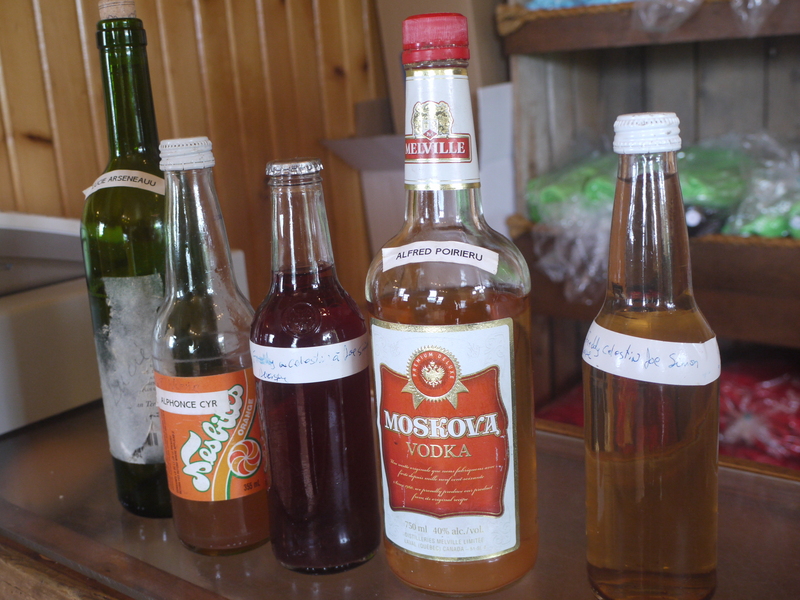 I had been told by a resident of the Magdalen Islands (a Madalinot), that for as long as memory, each family has kept a secret recipe for their home brew, called Bagosse. Behind the counter was a man who I could see right away would not just sell us a bottle of Bagosse, but an experience. 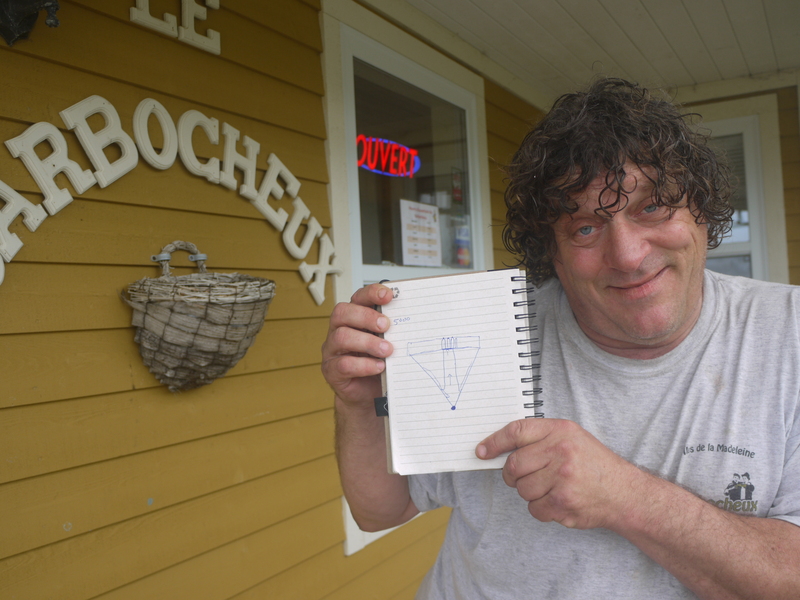 Léonce Arsenault, does not just create “artisanales boissons,” (artisan drinks,) but is also every bit the raconteur. Léonce is a grand man, with a head of curly hair, and eyes that tell the story along with the tongue. He started with this poem of unknown origin. Then Léonce told me the story of how Bagosse is made – it sounded simple, as if everyone could make it. And perhaps he is right, because it is a true tradition and many islanders I spoke to, both young and old, had a friend who still makes Bagosse. “Water, sugar, and yeast” he said, that is the base. I threw out some examples and he shook his curls, yes, everytime. Vegetables, flowers, anything that grows and is edible seems to work. He shared with me the story of how the word Bagosse evolved. According to his tale, the Spanish upper class collected fruit and at the bottom of the barrel a residue was left that they simply threw away or gave to the poor. The starving poor at that time, added sugar, and water to the mixture and called it Bagadzo. This tradition was passed onto the French. The name has changed over time to Bagosse. Léonce said that everywhere the French went, they took Bagosse, so when they came to North America, it arrived with them. Léonce knew that I wanted to learn about how families make Bagosse. He ran to his basement and brought up five dusty bottles, all partially full of alcohol, each one with a hand scribbled label. He explained that he has collected 50 bottles of homemade Bagosse from families around the Magdalens. When family members come to his shop, he gives them a taste of the Bagosse of their ancestors. Léonce hopes to have an exhibition and display his collection next year. Five bottles from Leonce’s collection of fifty bottles of Bagosse from different families from the Magdalen Islands. Léonce is licensed to produce and sell three kinds of Bagosse. Strawberry, Cranberry-Dandelion, and Blueberry. He produces other liqueurs and rhubarb flavoured sparkling L’Ariel, among other products. He gives tastings and talks. The passion of Léonce for the Magdalen Islands was unmistakable. He talked about a dream to create a walking pilgrimage that would take visitors to see the true beauty of the islands, and his wish to have the Islands declared a World Heritage Site. And then he told us the entire geological history and creation of the Magdalen Islands… and then we drove back up the lane clutching our bottle of Bagosse made by man with a taste for tradition.